The festival of lights, Diwali, is over but you can still win fortunes for yourself if you are playing at RummyCircle. The premium site in offering Indian rummy games has announced this tournament over a month ago which made many players anticipated and waited. The rummy tournament boasts a big prize pool worth Rs.1 crore shared between the top players who reach the grand finale. The tournament is a multi-tier one with multiple satellite rounds to earn your ticket to the grand finale scheduled for 29th October. The Satellite rounds will start running from 23rd October and can be easily joined with a small entry fee. If you want to pay less but want to make your way to the finale, you can play on the Shooter rounds to get your free entry to the Satellites. How to Join Diwali Rummy Tournament 2017? The yearly Diwali Rummy Tournament from RummyCircle will run from 23rd to 29th October 2017. The registered cash players at the site can join this tournament via multiple options say, Shooters, Satellites or Direct Buy-in to the grand finale. There will be 5 Shooters running every day between 23rd and 27th October that can be joined with an entry fee of Rs.125. A total of 600 players can join each of these rounds, and the top 68 players will be rewarded with a Satellite ticket. The Satellite rounds are the best chance to show your mettle on 13 cards online rummy variation. There will be one Satellite round every day between dates 23rd and 27th October that can be joined either with a winning Shooters ticket or with an entry fee worth Rs.1250. There are also three Super Satellite rounds running every day between the dates above that can be joined with an entry fee of Rs.12,500. 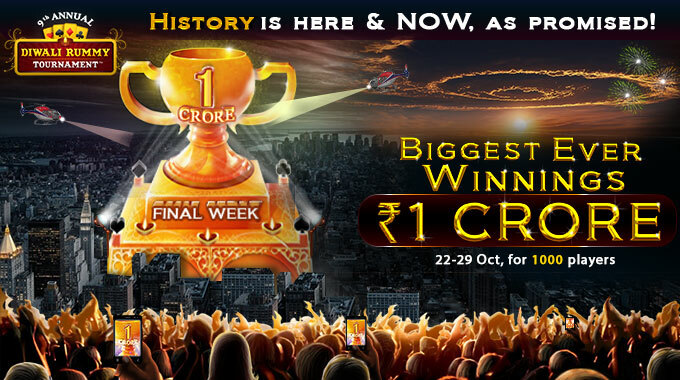 The top 1000 players who have earned their Week 4 Tickets will join the grand finale tables on 6:00 PM, 29th October, Sunday for a final clash to win fortunes worth Rs.1 Crore. Even if you have won the ticket, you need to make a registration for the grand finale to get seated. So, don’t forget to check back on RummyCircle.com on 29th October and book your seat between times 9:00 AM and 5:59 PM. The Diwali Rummy Tournament is your best chance to polish your knowledge in online Indian rummy card game rules and to apply your unique strategies to make some fortune. The festive season can get better if you win from a prize pool worth Rs.1 Crore. So, join the Shooters or Satellites today and make sure you get seated for the Sunday Finale!